The Missaukee County Historical Museum, located in the Missaukee County Park, is open on weekends from 1 - 4 pm during the summer. artifacts from all time periods. Come and browse local history and take a trip back in time. "The Last Sunday in June of each year" as Log Cabin Day. with the Log Cabin Society of Michigan, Sodus, Michigan. for all the pine lumber covering this quarter section (160) acres. 1886 - James Carmichael paid $400.00 to the railroad for 60 acres. and prepared, then brought back. 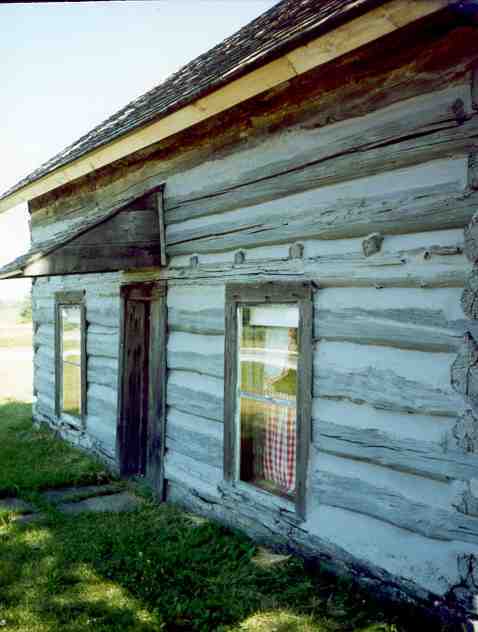 The cabin was built where it stands. 1916 - George W. and Anna Couch sold the farm to Frank and Pearl Bowen for $1,700.00. They reserved the crop of potatoes and millet growing on the farm. 1926 - The farm was in default and sold by Sheriff William Brown to Marion and Lillian Kelly. 1928 - The Kelly's sold to Frank and Stella Tuefel for $2,100.00. 1943 - The Tuefel's sold the farm to A.H. Hunt and Sons. 1965 - Sold to Charlie Kalis. 1987 - Sold to Frank and Dorothy Sucher. the public with no fee charged and operated only with donations. Summarized from information provided by Madalyn Sundell. Upstairs at the log cabin. Downstairs at the Log Cabin. Visit the Michigan Family History Network for more Missaukee County names. Back to the Missaukee County Page!